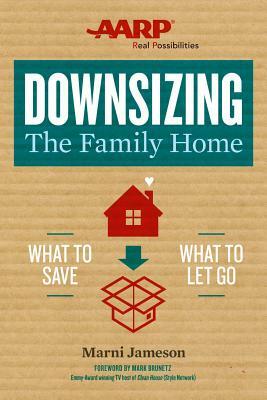 It's a rite of passage almost no one will escape: the difficult, emotional journey of downsizing your or your aging parents' home. Here, nationally syndicated home columnist Marni Jameson sensitively guides readers through the process, from opening that first closet, to sorting through a lifetime's worth of possessions, to selling the homestead itself. Using her own personal journey as a basis, she helps you figure out a strategy and create a mindset to accomplish the task quickly, respectfully, rewardingly--and, in the best of situations, even memorably. Throughout, she combines her been-there experience with insights from national experts--antiques appraisers, garage-sale gurus, professional organizers, and psychologists--to offer practical wisdom and heartwarming advice so you know with certainty what to keep, toss or sell. Marni Jameson is America's most-loved home and lifestyle columnist. Her humorous and helpful column appears in 25 papers nationwide, reaching seven million readers each week, including loyal followers who have been following her home adventures for a decade. Jameson has written two critically acclaimed books: The House Always Wins: Create the Home You Love Without Busting Your Budget and House of Havoc: How to Make and Keep a Beautiful Home . . . (both Da Capo Press). A top-tier journalist, Jameson has written for many national women's magazines, including Woman's Day and Family Circle, and major metropolitan newspapers. A frequent guest on local and national TV and radio, she has appeared on many programs, including NBC Nightly News with Brian Williams, Martha Stewart Living, and Fox and Friends. She lives in Orlando, FL.